In partnership with Nottingham City Council and Sustrans, we are offering Bike Courses for unemployed Nottingham City residents seeking work. One of our experienced friendly mechanics will guide participants through the course in our professionally equipped workshop. Contact Charlotte on 07825285122 to find out more about the eligibility criteria and to book your place! Build a Bike: Participants choose a bike and work step by step through the rebuild until it is fully serviced and ready to ride. This course runs over two days with a maximum of three people per course. We also provide a FREE helmet, lock, lights, bike toolkit and one year’s access to our open-workshop. Bike Maintenance: Participants will learn the basic bike mechanics to look after their own bike. 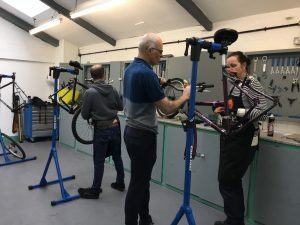 The course includes key skills such as: fixing punctures, setting up brakes and gears and replacing a chain. *These courses are some of the Sustrans Access to Work Projects, part of Nottingham and Derby City Councils’ Access Fund Programme.